No, do not re-adjust your screen. This is not a vision into the depths of your nightmares, it’s just my new cat teapot. And may I add with pride [quickly followed by a hint of shame], I now have a cat teapot collection. A clowder of cat teapots, if you will. I suppose it all started way back when Emily and I visited the Merchants Market for a blogger feature of hers. That’s when I spotted my first cat teapot; the little portly lady-cat teapot who looks like she rather enjoys sausages. Then the other day I spotted this gentleman-cat teapot in the window of NCBI Charity Shop. It was after hours so the shop wasn’t open, so the next day I cycled over and scooped up my purchase. PRO TIP – run your hand under the tap and using the palm of your hand, begin to brush your clothes. The water on your hand will collect any fur. When your hand stops collecting fur, simply run it under the tap again. Repeat until all the lonely people glitter, I mean fur, is gone. Voila! 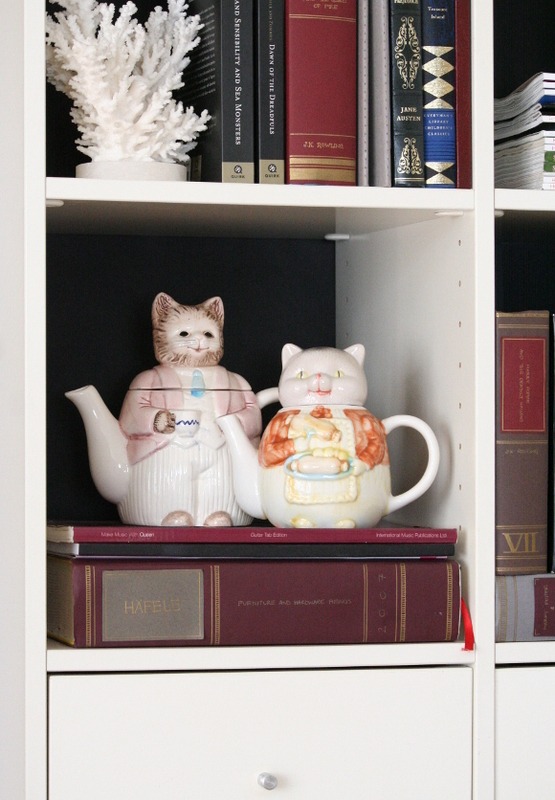 I’m not entirely sure where I’m going to keep Mr. and Mrs. Cat Teapot, but I quite like where I styled them on our shelves. Not too bad. And please don’t tell me I’m the only one with a porcelain animal collection? Don’t leave me hangin’. Love the glitter — um, I mean hair removal tip! I do have a teapot collection, but sadly none in kitty form. I may have to address that. This does not make them any less disturbing! Lovely to see your kitty teapots. For many years I had a gentleman cat teapot in which I brewed my best darjeeling but having managed to keep him carefully all that time, one day some clutter fell from a shelf above and knocked his head right off. Alas, it has smashed beyond repair and an intense internet search hasn't turned up a possible replacement. Now I have a headless cat teapot which, Marie, is even more disturbing. Oh noooo Cassandra! 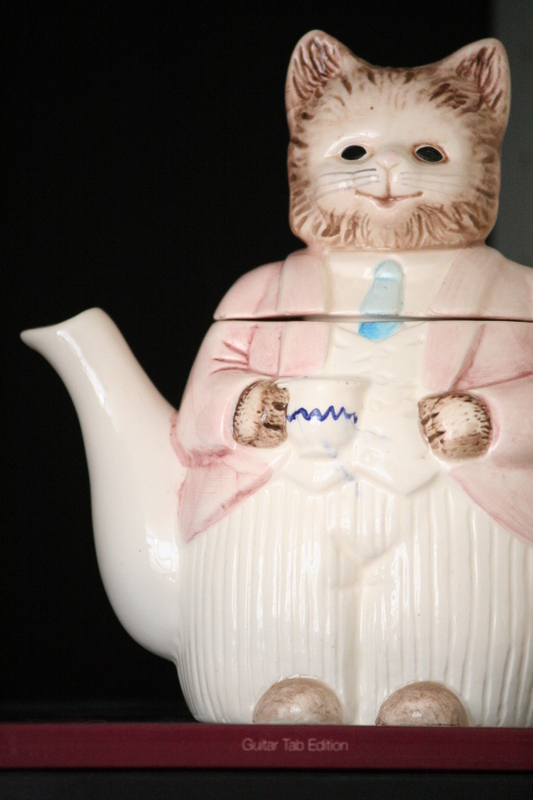 I'm so sorry to hear about your kitty teapot. Have you tried checking flea markets? 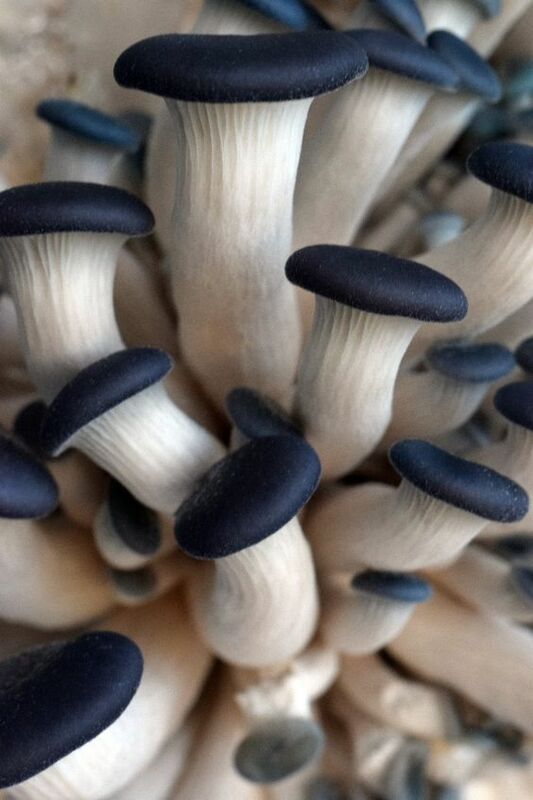 I know it's a long shot trying to find the exact same one, but maybe if you get talking to some stall holders they might keep an eye out for you. Or charity shops. They're great for unusual stuff. Then again, it's a real long shot. I hope your disturbing headless kitty teapot finds an appropriate head again soon.